Igneous — they form from the cooling of magma deep inside the earth. They often have large crystals (you can see them with the naked eye). Metamorphic — they are formed through the change (metamorphosis) of igneous and sedimentary rocks. They can form both underground and at the surface. Sedimentary — they are formed through the solidification of sediment. They can be formed from organic remains (such as limestone), or from the cementing of other rocks. Lava flow on Hawaii. 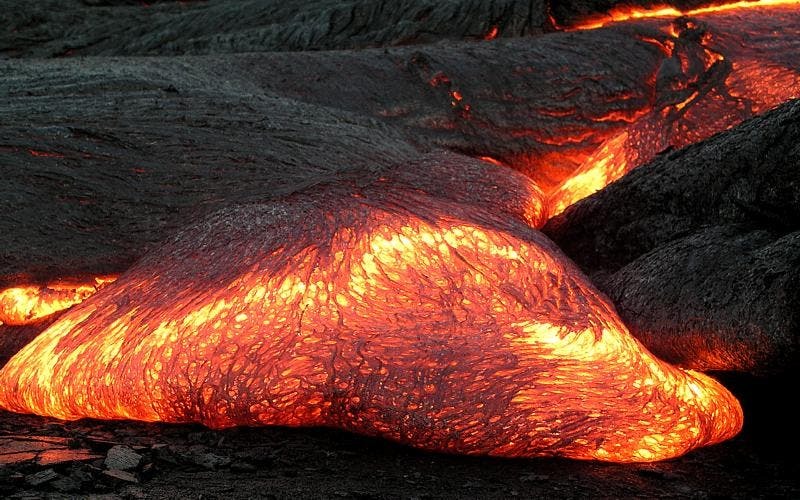 Lava is the extrusive equivalent of magma. Image via Wiki Commons. Magma is the heart of any igneous rock. Magma is composed of a mixture of molten or semi-molten rock, along with gases and other volatile elements. As you go deeper underground, the temperature rises; go further and you’ll eventually reach the Earth’s mantle — a huge layer of magma surrounding the Earth’s core. As you probably know, when magma cools, it turns into rock; if it cools while still underground at high temperatures (but at temperatures still lower than that of the magma), the cooling process will be slow, giving crystals time to develop. That’s why you see rocks such as granite with big crystals — the magma had time to cool off. The crystals are also differentiated, as you can see below. Note the white, almost rectangular feldspar crystals, the grey virtually shapeless quartz crystals, and the black crystals, which can be either black mica or amphibole. Image modified from Eastern Illinois University. However, if the magma erupts or is cooled rapidly, you instead get a volcanic rock –– not really igneous, but also originating from lava. The classical example here is basalt, which can have many small crystals or very few large ones. Volcanic rocks are also called extrusive igneous rocks, as opposed to intrusive igneous rocks. Some volcanic rocks (like obsidian) don’t have any crystals at all. Basalt — note the almost complete lack of visible crystals. Now compare it to the granite. Image via Georgia State University. Here, the name says it all. These are rocks that underwent a metamorphosis; they changed. They were either sedimentary or igneous (or even metamorphic), and they changed so much, that they are fundamentally different from the initial rock. Different types of metamorphism. Image via Tankon Yvtar. contact metamorphism (or thermal metamorphism) — rocks are so close to magma that they start to partially melt and change their properties. You can have recrystallization, fusing between crystals and a lot of other chemical reactions. Temperature is the main driver here. regional metamorphism (or dynamic metamorphism) — this typically happens when rocks are deep underground and they are subjected to massive pressure — so much so that they often become elongated, destroying the original features. Pressure (often times with temperature) is the main driver here. 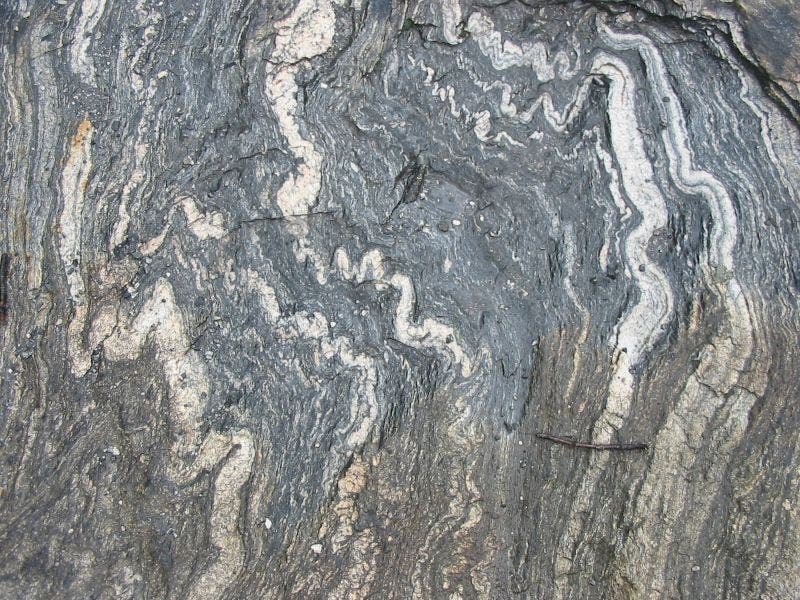 Folded foliation in a metamorphic rock from near Geirangerfjord, Norway. Image via Wiki Commons. Metamorphic rocks can have crystals and minerals from the initial rocks as well as new minerals resulting from the metamorphosis process. However, some minerals are clear indicators of a metamorphic process. Among these, the most usual ones are garnet, chlorite, and kyanite. Equally as significant are changes in the chemical environment that result in two metamorphic processes: mechanical dislocation (the rock or some minerals are physically altered) and chemical recrystallization (when the temperature and pressure changes, some crystals aren’t stable, causing them to change into other crystals). 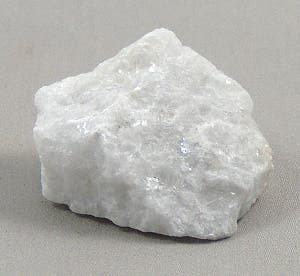 Marble is a non-foliated metamorphic rock. 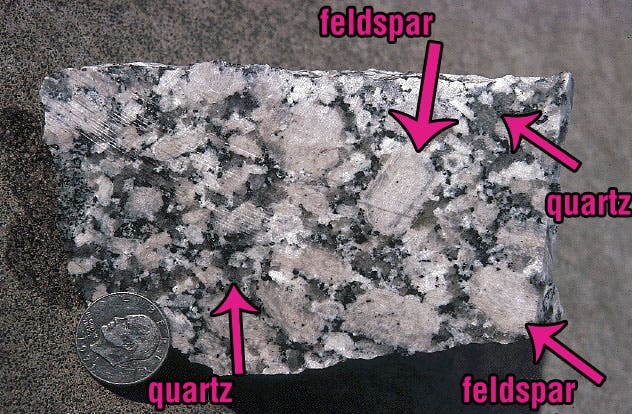 Foliated metamorphic rocks — pressure squeezes or elongates the crystals, resulting in a clear preferential alignment. Non-foliated metamorphic rocks — the crystals have no preferential alignment. Some rocks, such as limestone, are made of minerals that simply don’t elongate, no matter how much stress you apply. Metamorphic rocks can form in different conditions, in different temperatures (up to 200 °C) and pressures (up to 1500 bars). By being buried deep enough for a long enough time, a rock will become metamorphic. 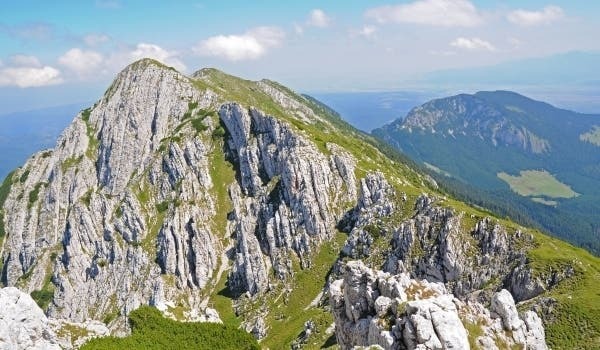 They can form from tectonic processes such as continental collisions, which cause horizontal pressure, friction and distortion; they can also form when the rock is heated up by the intrusion of magma from the Earth’s interior. A micaschist. 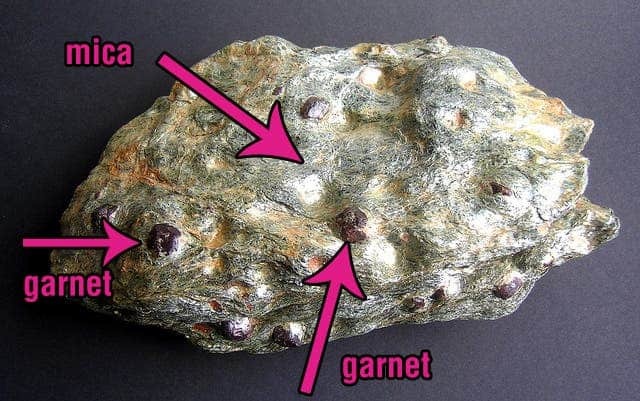 The dark brown rounded minerals are garnet, and everything you see with a whiteish tint is the mica. The reddish areas are rusty mica. Image modified from Willowleaf Minerals. Sedimentary rocks are named as such because they were once sediment. Sediment is a naturally occurring material that is broken down by the processes of weathering and erosion and is subsequently naturally transported (or not). Sedimentary rocks form through the deposition of material at the Earth’s surface and within bodies of water. 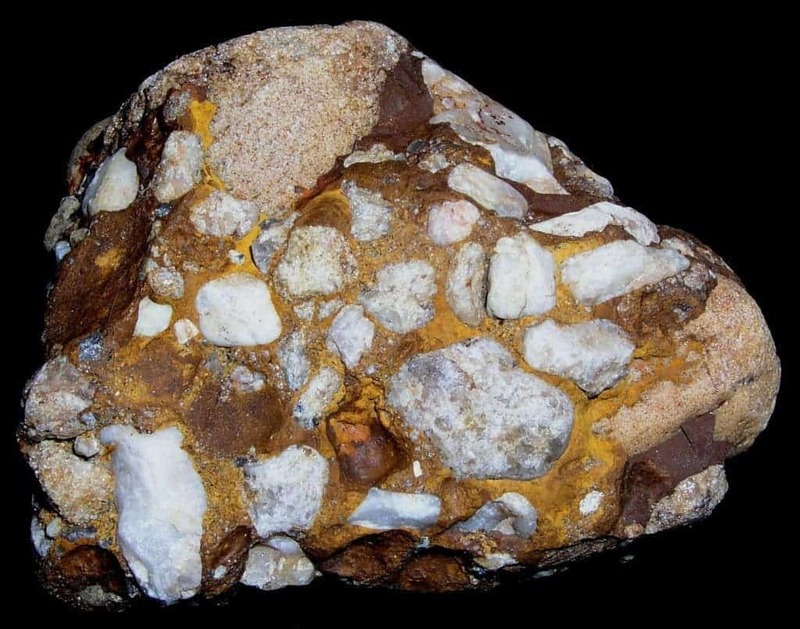 A conglomerate — a rock made from cemented gravel. Image via Earth Physics Teaching. clastic sedimentary rocks — small rock fragments (many silicates) that were transported and deposited by fluids (water, bed flows). These rocks are further classified by the size and composition of the clastic crystals included in the sedimentary rocks (most often quartz, feldspar, mica and clay). 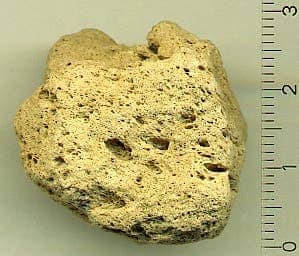 conglomerates (and breccias) — conglomerates are predominantly composed of rounded gravel, while breccias are composed of angular (sharper) gravel. sandstones — as the name says, it’s a rock made from many-sand-sized minerals and rock grains. The most dominant mineral in sandstone is quartz because it is the most common mineral in the Earth’s surface crust. 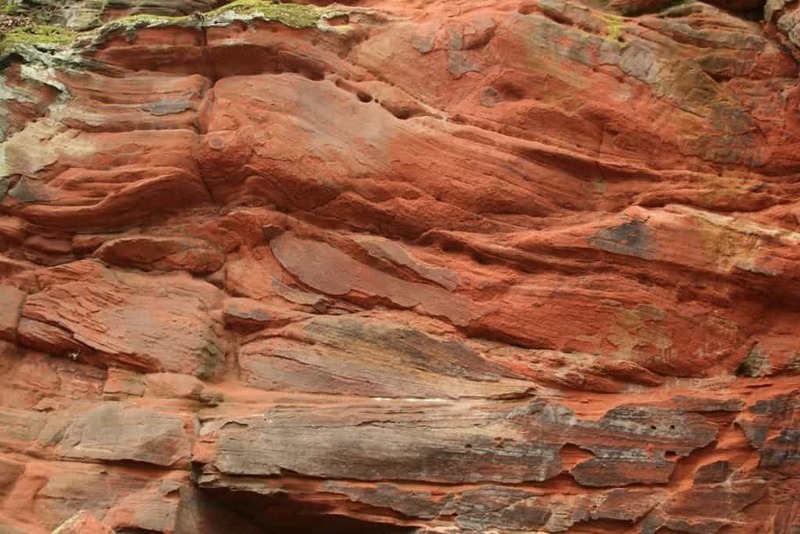 An old, red sandstone. Image via Ian Hopkinson. mudrocks — again, the name says it all — they’re rocks made from solidified mud. They typically contain very fine particles and are transported as suspended particles by turbulent flow in water or air, depositing once the flow settles. biochemical rocks — you’ll probably be surprised to find out that most limestone on the face of the Earth comes from biological sources. In other words, most limestone you see today comes from the skeletons of organisms such as corals, mollusks, and foraminifera. 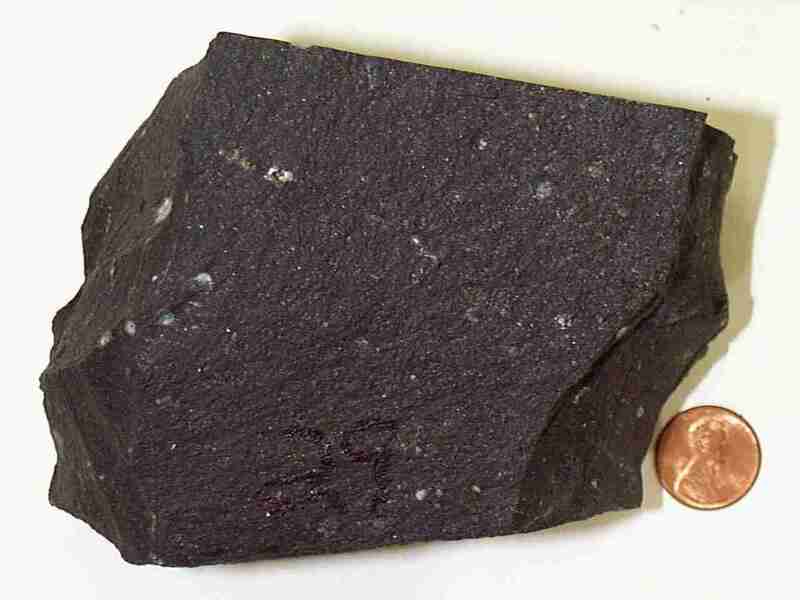 Coal is another example of biochemical rock. Yes, salt is a mineral — and it can be quite beautiful. 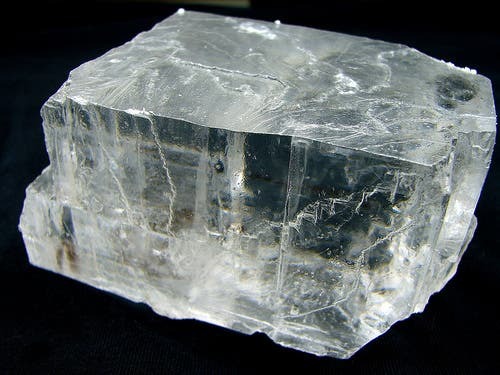 In this context, it’s called halite and can be classified as a sedimentary rock. There are also other types of specific sedimentary rocks — for example, the ones formed in hot springs. Most of the solid surface of our planet (roughly 70%) is represented by sedimentary rocks, but if you go deep enough beneath the Earth’s surface, there are plenty of igneous and metamorphic rocks to be found. As I mentioned with biochemical rocks, fossils can become rocks in time. You can actually have entire mountains made up from reefs like you can see below. This is just scratching the surface — you could spend a lifetime studying rocks and still be surprised. But I hope that for your general knowledge or to impress some friends (or if you’re considering starting geology), the information here was useful and interesting to you. Feel free to send any questions and comments my way and I’ll do my best to answer them!